Watch for sky shows this month. The Draconids, North Taurids (Northern Hemisphere, South Taurids in Southern Hemisphere) and the Orionids are all shooting across the sky. If lucky enough to have a cloudless sky, very little moonlight and no street and commercial lights, you may catch a shooting star. 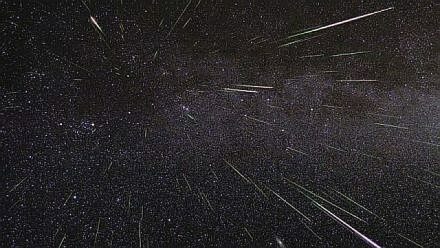 Actually meteorites merely look like falling stars as they streak across the sky. Light from the moon won’t interfere with seeing the Draconids that peak the evening of Oct. 9, 2018 because the moon will be in its new phase. The Taurids are around all month but don’t worry, you can still catch them Nov. 8 during the next new moon phase. The Orionids will be peaking around Oct. 21 but the moon will be waxing gibbous (more than half) as it heads to becoming a full moon Oct. 24. 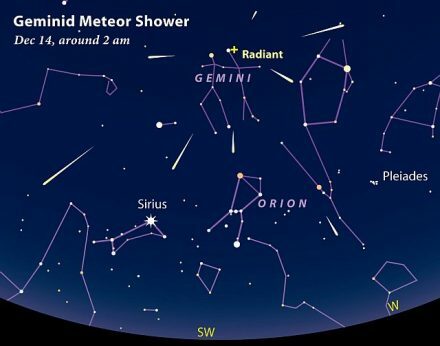 So how many meteorites might be up there during each shower? Well, it’s hard to predict the Draconids. They may be producing only a few per hour but the good news is that you don’t have to stay up late to watch for them and some years they produce quite a show with more than 500 meteorites an hour. Their radiant point is from the head of Draco the Dragon near the stars Eltanin and Rastaban and they are best seen when the Dragon is highest in the evening sky. The Draconid shower happens when the Earth crosses the orbital path of Comet 21P/Giacobini-Zinner. The Taurids, originating from Taurus the Bull, are residue from the Comet 2P Encke. 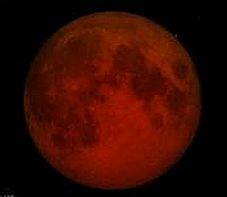 There aren’t a lot of them per hour and they may peak towards the end of October when the moon is still in its bright waning gibbus phase. But the good news is that they are around all month. Watch for them early morning before dawn. The other good news is that they are very bright balls of fire. The Orionids typically fly across at 20 meteorites per hour but have been known to quadruple that number. Look for quick streaks of bright light. They’re fast. Best Orionids watching time is before dawn when the moon sets by 1 a.m. and meteorite numbers are highest. The particles come from Comet 1P/Halley. The Orionids are named for their radiation point which is near the constellation Orion (The Hunter). In October, Orion is best visible around 2 a.m.
For good sky reference sites visit NASA, Earth/Sky, Space and Time and Date. The “Preserve Route 66” motorcade invites travelers to meet up at a variety of good Route 66 sights and destinations. The first segment is Chicago to Springfield that is the first week of July. The Missouri segment is July 6-10. You can catch up with the group, join them at any date that suits your schedule or use their schedule of stops as a guide for your own trip. Their meetups are free and open to the public. Since Springfield, IL is on the list, here are some recommendations of places to stay and things to do in the capital city of “The Land of Lincoln.” St.Louis is next with where to stay, eat and go. But first, if coming from Chicago, go downtown to where it supposedly begins. 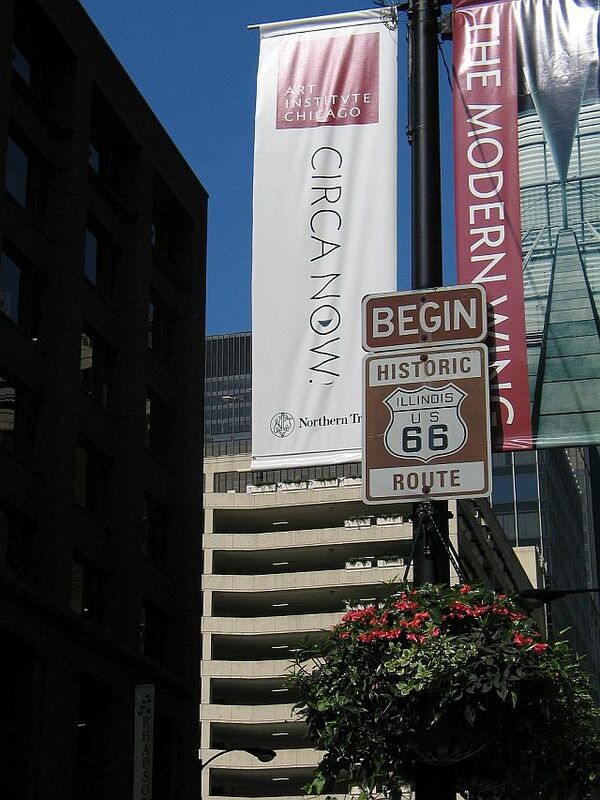 The route historically starts in Grant Park near Jackson boulevard, east of Michigan Avenue. 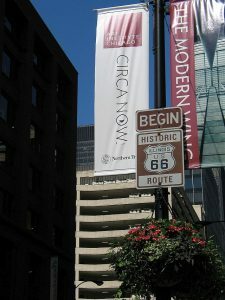 However, the sign for it can be found across Michigan Avenue opposite the front entrance to the Art Institute of Chicago. In Illinois I-55 (known in Chicago as the Stevenson Expressway) basically follows historic Route 66. Illinois has posted Route 66 signs along the popular old road. Tip: Chicago to Springfield is about 197 miles so plan on it taking about 3 ½ hours. Police do patrol the highway. 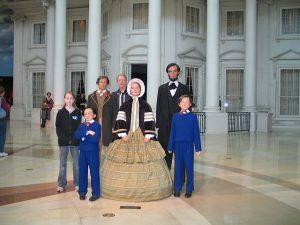 The city has enough fascinating Lincoln spots from the Lincoln Museum and his home, to the Old State Capitol building and the current Capitol building, to fill two days so look for a place to stay that makes it a fun vacation. Where to stay – The Springfield Visitors and Convention Bureau is a great resource for places to stay, eat and see. If you like historic inns and B&B’s consider The Inn at 835. An early 1900’s former apartment house, the Inn is listed on the National Register of Historic Places. Two places close to the action are The President Abraham Lincoln Hotel and the State House Inn. Tip – Wear comfortable shoes and bring the sunscreen. This is a walking town. An option for people who like a pool and sauna break after a day of sightseeing is to stay at the Crowne Plaza Hotel, a conference-style facility on the Dirksen Parkway at the edge of town near I-55. Unpacked and ready to go – Springfield is about Lincoln, about state government, about historic homes and about Route 66. Lincoln – Renew your acquaintance with the 16th President at the Abraham Lincoln Presidential Museum. You will be in for a remarkable two hours. Plan to spend at least that amount of time to see the movies and the exhibits that peel away the myths from the man and the times. While downtown Springfield, walk over to the Lincoln-Herndon Law Office, where he worked above Seth Tinsley’s dry goods store, and to the Old Capitol across the road where he served as a representative and gave his “house divided” speech. Also visit his and Mary Todd Lincoln’s home. Then drive north of downtown to the Lincoln Tomb where he, his wife and three of their four children are buried. If time allows, drive north 20 minutes on IL Hwy 97 to New Salem, a wonderful village recreated with the timbered homes and stores that existed when a young Abe Lincoln worked there. State government – Tour the Old Capitol, Illinois’ fifth statehouse (but first in Springfield) to see where bills were debated and state laws passed from 1839 to 1876. The building was reconstructed in the 1960’s. The impressive dome of the State Capitol, 361 feet above ground can be seen from miles away. But go inside to see where legislation has been argued and passed from 1888 to today in the House and Senate chambers on the third floor. Historic homes – Unless you are a Frank Lloyd Wright maven you might not know that one of the best examples of his work is the Dana Thomas House in Springfield. It still has all of its original art glass and much of its original furnishings. Also put the Vachel Lindsay Home on the itinerary. Built in the late 1840’s, the house was home to Mary Todd Lincoln’s sister Ann. Vachel Lindsay’s parents bought the house in 1878. It was the poet’s home until his death in 1931. Route 66 – Visitors can go back in time by taking in a double feature at the Route 66 Drive In or stop for a bite at the Cozy Dog Drive In, where the family still makes the famed “hot dog on a stick” that they have been serving up since 1946. Another must stop is the Moterheads Bar, Grill and Museum. Rte 66 places are included in Things To Do/Attractions. However, car enthusiasts really into what is the Mother Road of historic routes come for the town’s annual International Route 66 Mother Road Festival in September. This year’s festival is Sept. 21-23. That is when hundreds of vintage vehicles from street rods to motorcycles will roll into town and live music fills Springfield’s downtown streets. For more information Springfield Convention & Visitors Bureau. Also visit Illinois Route 66 Scenic Byways.